Missouri state Trooper Joshua Hughes, St. Charles County (Mo.) Ambulance District paramedic Michael Buechner, Carnegie Hero Jennifer E. Emo, Hero Fund volunteer presenter Mark Petzel, St. Charles County Ambulance District paramedic Amy Jennings, and state Trooper Eric Graslie pose after Emo received her Carnegie Medal at a presentation held Dec. 12 at the Missouri Highway Patrol Troop C headquarters in Weldon Spring, Mo. A 37-year-old veterinarian of St. Louis, Emo was driving on an interstate highway when she saw a burning sedan on the shoulder. She stopped at the scene and, amid rapidly spreading flames in the interior, backseat area of the vehicle, reached into the rear of the car and removed a 2-year-old girl who was burning. She lifted the girl out of the car and rolled her in grass to smother the flames on her clothing. The girl was airlifted to the hospital for treatment of severe burns but later succumbed to her injuries. Emo suffered burns to her hands and left arm during the rescue effort. 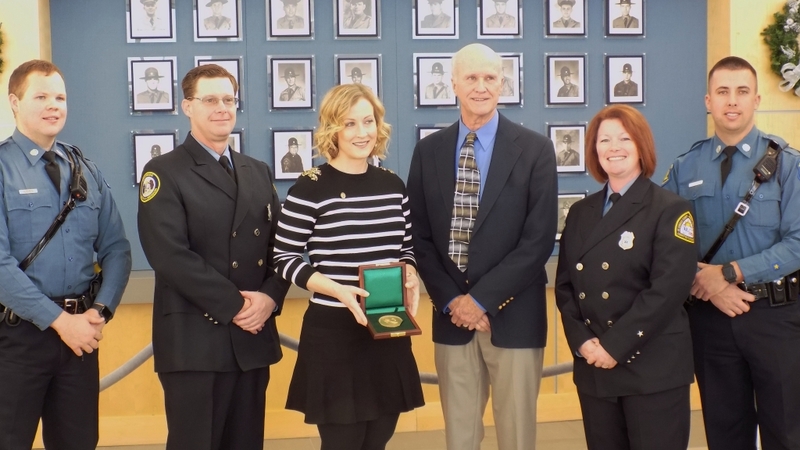 O’Fallon, Mo., resident Petzel, who presented the Medal to Emo, is the great-grandson of Carnegie Hero Herman J. Petzel, who died in 1905 attempting to save an 18-year-old man from drowning in Sutter Station, Mo.